Last time, I announced here that Atlantis Productions postponed Shrek the Musical to give way for Disney's Aladdin: The New Stage Musical. Today, the theater company that gave us the hit stage musicals such as Avenue Q, Xanadu, In the Heights and Next to Normal announced the actors playing the lead parts of the show and they are featured on the very first promotional poster of the show. See the poster after the jump. Playing Princess Jasmine is recording artist K-La Rivera who we all first seen on stage as Nina in Atlantis Production's In the Heights. 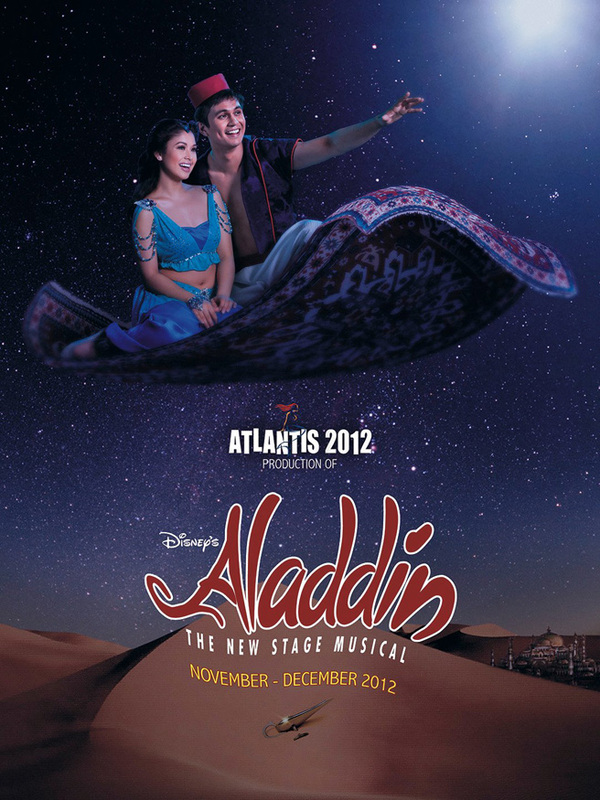 Joining her is Tom Rodriguez on his first professional theater gig playing the title role, Aladdin. Personally I'm loving how she looks on that costume and I believe her voice also fits the role. Physically speaking Tom Rodriguez fits the description of Aladdin. I've only seen him in one movie and I haven't heard him sing. So for now I can't comment if he is indeed rightful for the role. I hope he is really good given that he will be carrying the whole show. Scheduled for a November-December 2012 run at the Meralco Theater, Pasig City. Disney's Aladdin: The New Stage Musical is brought to us by Atlantis Productions. Shows are now available for show-buying and fund-raising opportunities. For details, call 892-7078. UPDATE: Just saw this on youtube. Probably Kapamilya fans already heard Tom sing. Since I seldom watch local variety shows this past few months, I don't really have the chance to catch any of his performances. Thanks to youtube here's an amateur video taken on a certain live show. Hmmm looks like the guy can really sing. What do you think?